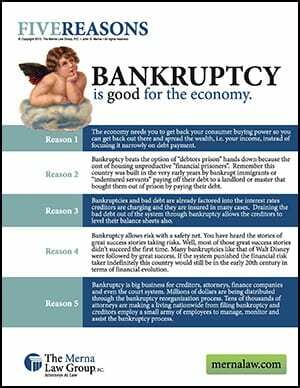 Five reasons why bankruptcy is good for the economy. The economy needs you to get back your consumer buying power so you can get back out there and spread the wealth, i.e. your income, instead of focusing it narrowly on debt payment. Bankruptcy beats the option of “debtors prison” hands down because the cost of housing unproductive “financial prisoners”. Remember this country was built in the very early years by bankrupt immigrants or “indentured servants” paying off their debt to a landlord or master that bought them out of prison by paying their debt. Bankruptcies and bad debt are already factored into the interest rates creditors are charging and they are insured in many cases. Draining the bad debt out of the system through bankruptcy allows the creditors to level their balance sheets also. Bankruptcy allows risk with a safety net. You have heard the stories of great success stories taking risks. Well, most of those great success stories didn’t succeed the first time. Many bankruptcies like that of Walt Disney were followed by great success. If the system punished the financial risk taker indefinitely this country would still be in the early 20th century in terms of financial evolution. Bankruptcy is big business for creditors, attorneys, finance companies and even the court system. Millions of dollars are being distributed through the bankruptcy reorganization process. Tens of thousands of attorneys are making a living nationwide from filing bankruptcy and creditors employ a small army of employees to manage, monitor and assist the bankruptcy process.